The record-breaking records annual is back and packed with more incredible accomplishments, stunts, cutting-edge science and amazing sporting achievements than ever before. With more than 3,000 new and updated records and 1,000 eye-popping photos, it has thousands of new stats and facts and dazzling new features.There is so much to explore inside. Go on a whirlwind tour of the planet's most amazing places, from the largest swamps to the deepest points on Earth. Find out what happens when you give an octopus a Rubik's Cube, and why all you need to defend yourself from a crocodile is a rubber band! You'll also find all your favourite records and categories such as Big Stuff, Collections, Mass Participation and Fun with Food, plus the year's most significant sporting achievements. Our editors have also taken inspiration this year from the world of superheroes - both fictional and real-world - so look out for our feature chapter charting your favourite caped crusaders in comic books, TV shows and movies. We also meet the real-life record-breakers with genuine superpowers, such as the Canadian strongman vicar who can pull a jumbo jet and an actual cyborg who uses technology to augment his senses. You'll also learn all about the science of superheroes, such as who the fastest and strongest superheroes would be if they came to life, and who would win in a royal rumble between Superman, Batman, Hulk and Dr Strange!Also new this year is a celebration of the superlative with infographic poster pages that explore the most exciting absolutes, such as the longest, tallest, fastest and heaviest. Does the longest sofa outstretch the longest train? Is the tallest Easter egg bigger than the tallest snowman? Find out in this amazing new edition. 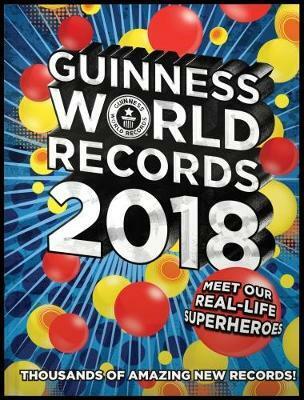 You'll also find these special pages available as free poster downloads at guinnessworldrecords.com!From science to showbiz via stunts and sports, there are real-life heroes all around us in all shapes and sizes, achieving the extraordinary every day. There's only one book where you'll find so many amazing facts all in one place, and that's Guinness World Records 2018!